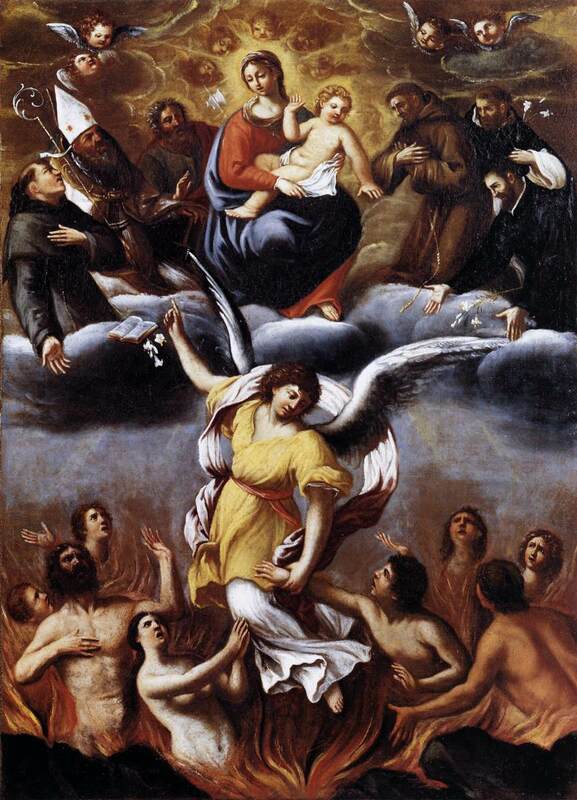 This year November 2, All Soul’s Day, the commemoration of those in Purgatory, replaces the Thirty-First Sunday in Ordinary Time. The readings teach us that the meaning of Purgatory and the meaning of death are both revealed in God’s love for us. The reading from John’s Gospel makes two central points, more fully explained in the first two readings. The first point is, “This is the will of the one who sent me, that I should not lose anything of what he gave me, but that I should raise it on the last day.” The key is in the impersonal word “anything.” Jesus saves not just us, but every “thing” about us. Indeed, we would not be truly saved if he left any aspect of our humanity behind. The second point is that “this is the will of my Father, that everyone who sees the Son and believes in him may have eternal life.” It is Christ who saves us. Our reading from the Book of Wisdom explains the connection to death, and to Purgatory. “They seemed, in the view of the foolish, to be dead.” It seems that life ends in “affliction” and “utter destruction.” This is the central riddle of human existence – the “foolish” are all those who lack the wisdom of Christ, and thus almost everyone. Without Christ, life seems to end in death. “But they are in peace. For if before men, indeed, they be punished” – death is the greatest punishment of all – “yet is their hope full of immortality; chastised a little, they shall be greatly blessed.” Death, we learn, is not the end – not for those who know Christ. Death, and all suffering, is rather a purgation, a passage. “As gold in the furnace, he proved them.” For the faithful, death is not destruction, but purgation. It is about burning away all that is not true, all that is not really us – not to destroy us, but to discover us, as gold is discovered when the dross is burned away. “As sacrificial offerings he took them to himself”: the fire of suffering does not destroy us, but lifts us up, turns us entirely to praise, but uniting our true selves to him. Then comes another key: “They shall judge nations and rule over peoples, and the LORD shall be their King forever.” Now, the problem of sin is that we act as if God is not our King. There are three possibilities for us whose hearts are not yet set on him. One is that we could remain sinners, and make our own judgments, but God would not be king. The second is that God could be king, but we would have to be passive, because our judgments would contradict his kingship. The third possibility is that we could be changed, so that our judgments are as his judgments: so that we can be true participants in God’s kingdom. This is why we must be purified: not so that we will be destroyed, but so that we can be fully active in God’s kingdom, so that we can fully embrace his will as our own. One way or another that has to happen, if we are to be happy when God is king. But it will take purification. That is the purpose of suffering: to turn our hearts fully to him. Christ’s death itself “proves his love for us,” it is a sign of “hope.” His cross is the sign that, if we are united to him, our own death, and all the little deaths of our suffering, are not ends, but passages to new life. What is your darkest suffering? How does Christ offer it to you as a path of transformation, of letting God be truly king?